Nutrition shakes (sometimes called "smoothies") are often great tools for busy parents in helping kids on the go get the vitamins and nutrients they need to grow up healthy and strong. Shakes typically consist of a base ingredient, such as water, juice or milk, some fresh fruit or other healthy ingredient and either ice or frozen fruit. With lots of ingredient options, shakes make it simple for caregivers to please even the pickiest young eaters. To make a great shake, it's important to have a few essentials in your kitchen. Start with a blender, cutting board and at least one knife to assist with chopping whatever fresh ingredients you'll use in your shake. 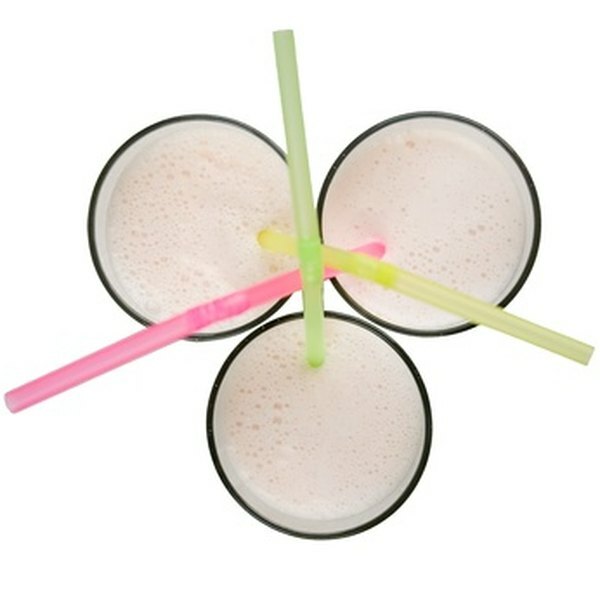 You'll also want to have some glasses or cups on hand for the finished shakes. You have lots of options when deciding on a base for your nutrition shakes. You can use water, milk, yogurt or even juice, depending on what you have in your refrigerator and what works best for your child. There isn't a right or wrong option when choosing a base; however, it's important to keep the total shake in mind when choosing your base. If your child wants to become healthier by losing weight, try water as a base to keep the total caloric value down. If the opposite is true and your child wants (or needs) to gain weight for medical reasons, choose whole or two-percent milk as your base. Also note that fruit juices rarely make good base options for children with diabetes. You have endless options for creating the perfect nutrition shake for your child. Some kids prefer fruit shakes, while others prefer chocolate shakes or even green shakes. Help your child learn to make appropriate decisions by involving him in the decision-making process the next time you set out to whip up a tasty shake. If he feels like a blueberry shake one day and a green shake the next day, encourage this exploration. Engaging in this way will help your child continue to love foods that maximize nutrition. The most important considerations when building shakes for your child are to find something that tastes great to the child and has at least one soft ingredient. Frozen ingredients, such as frozen fruit, will make the shake thicker and colder. If you want a more liquid shake, use only the soft ingredients and save the frozen options for another time. According to the Archives of Pediatrics & Adolescent Medicine, less than 7 percent of American children consume the recommended three servings of fruits and vegetables a day. Shakes allow you to sneak some wholesome greens into your child's diet. Greens aren't usually the first ingredients parents think of when making nutrition shakes, but it's actually fairly easy to sneak them in. Baby spinach, romaine lettuce and kale are all great green options. Add them in a 1:3 ratio to your fruit ingredients, to ensure the sweetness of the fruit balances out the bitterness in the greens. For example, if you add 1/3 of a cup of kale, add 2/3 of a cup of strawberries. Chocolate shakes will rarely seem like a bad idea to most children. However, when choosing flavors that turn nutritious, healthy shakes into regular milkshakes, make sure you help your child learn that these delicious shake varieties are "once in a while" treats, or add or subtract ingredients to make the shake healthier. For example, try adding bananas to a chocolate shake while decreasing the amount of chocolate by half, for a shake that still tastes delicious but is more nutritious. The American Academy of Pediatrics discourages the use of protein powders and supplements in foods and beverages for children and young adults. If you want to add some extra protein to your child's shake, opt for milk or yogurt as the base. Christa Cordova began writing in 2003. She leads Bites of Hope and Healthy Sprouts, organizations that provide nutrition information to cancer patients and new mothers. Cordova is a certified pregnancy fitness instructor and holds a Bachelor of Science journalism from the University of Kansas. She is pursuing health certifications from the Institute of Integrative Nutrition and the University of Michigan.